See the complete 10th Australian Pro Grand Prix from every round of the PREJUDGING to the posing routines, posedown and awards at the FINALS. The star competitors included KAI GREENE who the week before won his second Arnold Classic. 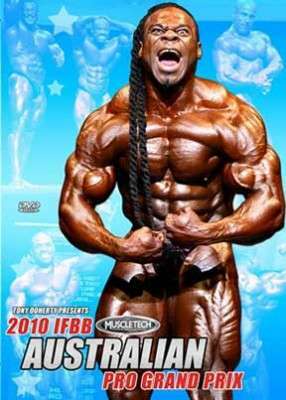 Also the 2008 Mr. Olympia DEXTER JACKSON, the Dutch sensation ROELLY WINKLAAR, and Aussie star MICHAEL KEFALIANOS. The star competitors included KAI GREENE who the week before won his second Arnold Classic. Also the 2008 Mr. Olympia DEXTER JACKSON, the Dutch sensation ROELLY WINKLAAR, Aussie star MICHAEL KEFALIANOS, plus winner of the best posing routine award in Melbourne – and the recent 2010 Phoenix Pro winner MELVIN ANTHONY, and new guy on the block with the Platz thighs – from USA GRIGORI ATOYAN. We also include interviews with the Comeback Kid – LEE PRIEST who was interviewed on stage by Tony Doherty, then Lee stripped off and hit some amazing poses for his fans. He was in incredible shape! The first time he has been really seen posing in public since his last contest victories in 2006. EXTRAS include interviews with RICH GASPARI, and the head judge from USA – JOHN TUMAN, and EXPO SCENES and PUMP ROOM HIGHLIGHTS. See group shot at Doherty’s Gym on the Sunday, photo at bottom.